In February, the Medicare contractors that structure the rules for Durable Medical Equipment (DME) claims issued a "coverage reminder" that prohibits SGDs from having any non-speech capabilities (e.g., syncing with SmallTalk, video calling, practice and communication activities). Manufacturers were instructed to remove all functionality beyond simple speech generation by September 1 or their devices would no longer be considered Medicare reimbursable. During this time period, we along with other organizations including other SGD manufactures, ASHA, the ALS Association, and other patient advocacy groups met with CMS officials to advocate for the people who use devices, and the features and functionality that make speech-generating devices useful in daily life and everyday communication. CMS offered an extension until December 1, 2014. However, before that date, CMS receded the rule, and opened the comment period for the NCD. Today, the same parties that met with CMS are continuing to work together to ensure the NCD accurately addresses the needs of SGD users. We are working to ensure adults with aphasia and other language disorders have access to the features and functionality that make SGDs useful for daily life. This includes keeping features like practice and communication activities, video calling, and syncing with our SmallTalk app. You can catch up on these features and their importance here. You can also listen to our Blog Talk Radio show on this issue here. There are a lot of ways you can help. First, you can offer public comment during CMS's 30-day window. We need speech-language pathologists, caregivers, patients, and SGD users to share the features and functionalities that are important to them with Medicare. Submit your comment here. Finally, continue to check back on our blog. We will update our audience as we receive more information. 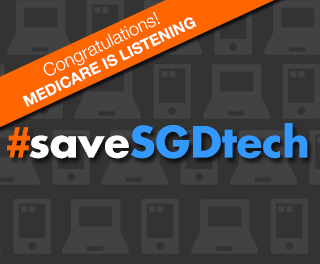 You can share this information on your social media networks with the hashtag #saveSGDtech. In the meantime, thank you for raising your voice and sharing your concerns with Medicare, your peers, and us. It’s working.